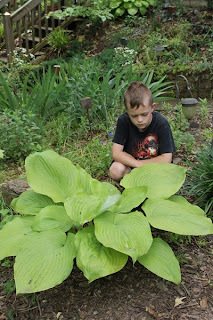 Whether jumbo like the Sum and Substance above (grandson Tad is my best garden helper!) or miniature like the little Blue Mouse ears at right, Hosta make a unique addition to a floral arrangement. 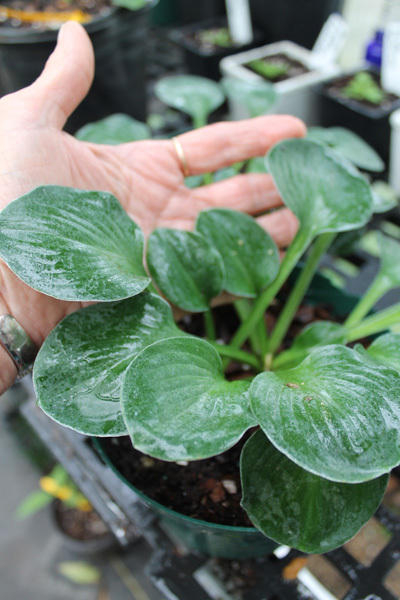 The flowers of many Hosta are beautiful and fragrant. The ones in the picture below are from my Choo Choo Train variety that lines one of my garden paths. 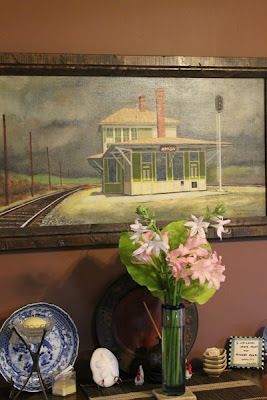 Both the leaves and flowers of this one are pretty with my pink surprise lilies - we call them naked ladies here in the south. 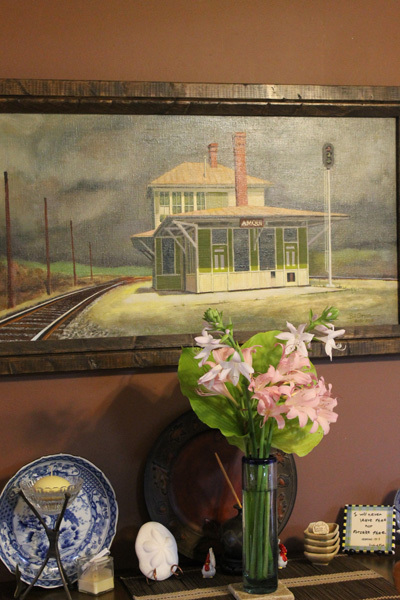 :-) The painting of the old Amqui Train Station is by my husband Bill. Bill is an accomplished artist and I'm pretty proud of him. Below are steps to making the vase lined arrangement. 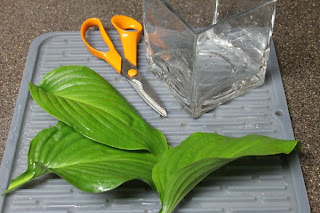 To line a vase with Hosta leaves choose leaves that will fit inside your vase and be totally submerged in the water. I chose small new leaves from one of my dark green Hosta to contrast with the lime foliage and Red Knock Out Roses (picture above). 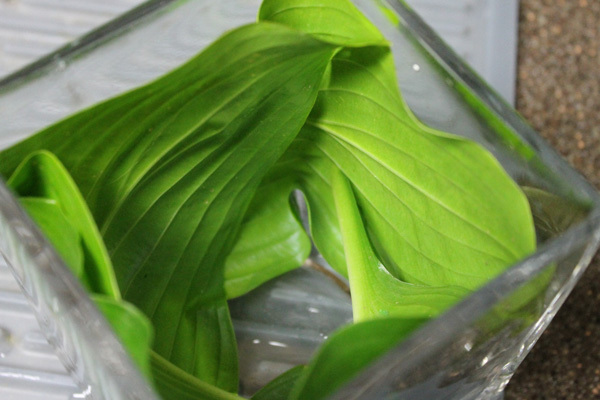 Start by deciding how many leaves it will take to go around your vase, lapping over each other. It took 3 leaves to go around my 4 inch square vase. 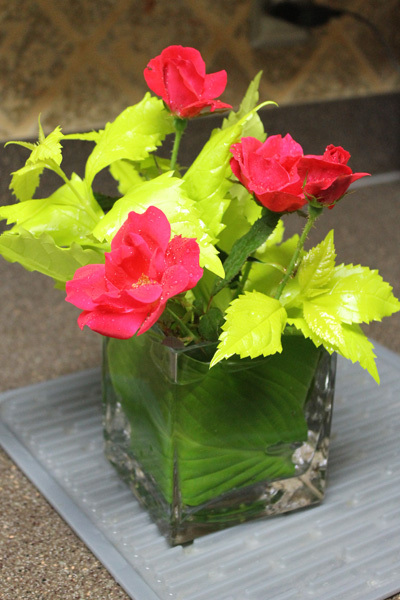 I started in one corner and pressed the leaves up against the side of the vase. 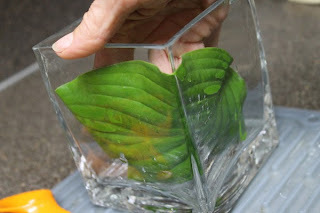 Now add other leaves behind the first keeping the stems hidden behind the leaves. 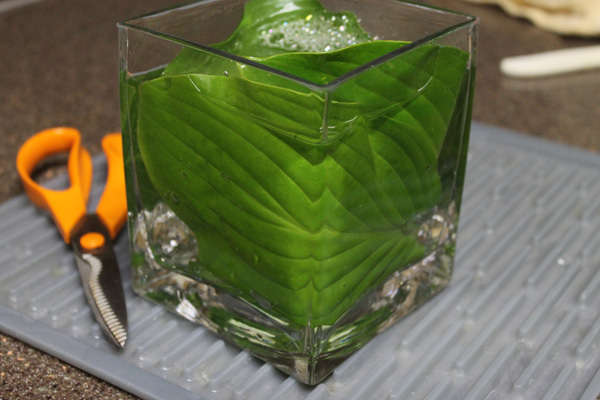 Continue until the vase is covered. Add water and flowers. The leaves will stay green and fresh for days!